Board-ups are not just for storm damage! At Orion Construction we are called out to board up or tarp your home or business for many other reasons. 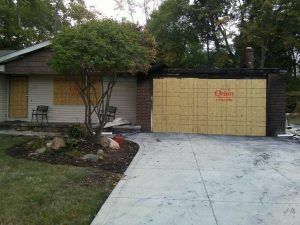 You may need us to board up your home or business due to fire, wind, vandalism, animal infestation or when a car runs into your structure. The importance to board up your home or business quickly is to secure the property from looting or more vandalism. After a severe wind, hail or snow storm Orion Construction is available 24/7 for emergency services for board ups and roof tarps to protect your property from more weather-related damage until you can get it fixed. It is important to secure your home against secondary damage. If you don’t take appropriate action to secure your home insurance companies might find neglect and therefore the secondary damage might not be covered by insurance. Orion Construction does not only provide service for board-ups and roof tarps, but we are a full-service general contractor to rebuild your home or business after fire, storm or wind damage. Call our office at 330-244-9708 for emergency board-ups.